Hit the brakes and slow your roll. Welcome to News Cycle, a weekly roundup of news aimed at downtown San Diego, especially those who choose to bicycle through the city. 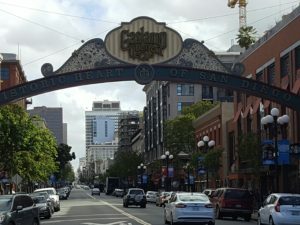 Here are a few snippets on where the cars aren’t, whether the Chargers will ever be playing downtown—let alone in San Diego County, and how you can eat your way through the Gaslamp Quarter. There are three general categories of opinion on the football stadium proposal in East Village. A third of the populace would sell their kids to build the Chargers a playground; a third would never pry a copper penny from their pockets to subsidize a billionaire team owner; and the middle third likes football but wants to do the right thing by taxpayers. This Voice of San Diego opinion piece makes a couple interesting points about mounting opposition to the two initiatives about stadiums that will be on the November ballot. That might be a good idea, except those initiatives have as much chance of passing as Donald Trump has of being elected President of Mexico. Friday was Bike to Work Day. The San Diego Union-Tribune reports that 1.3 percent of San Diegans bike to work, compared to 4.4 percent of San Franciscans. The local goal is to get 6 percent of San Diegans commuting by two wheels to work by 2020. The 22nd annual Taste of the Gaslamp is Sunday, June 26. It starts at 1 p.m. and for $30 (in advance/$40 day of) you can sample the wares from 40 Gaslamp Quarter eateries. Be the first to comment on "News Cycle: Rolling Around Downtown"